Manchester United have been handed a huge injury boost after Marcos Rojo confirmed that his return to first team football is closer than ever. The Argentine left back has been out injured for the past seven months after suffering a nasty knee injury in last season’s Europa League quarter final match game against Anderlecht but his return is imminent as confirmed by the player himself. The former Sporting Lisbon man is expected to play for United in the International Cup game for United reserves and has set a more realistic target of December 6 as his return to the first team. 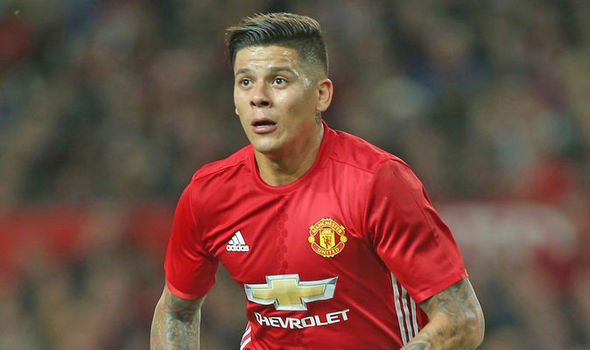 Rojo’s return is a massive boost given that the likes of Luke Shaw, Daley Blind and Matteo Darmian have not covered themselves in glory and the experienced Ashley Young is not a natural fit in that department. United face CSKA Moscow in the last Champions League group stage match on December 6, of which Rojo expects to feature. As quoted by the Manchester Evening News, he said, “Tomorrow, I am going to play a match with the reserves in a friendly match,” “I feel good. Up until now I have not had any problems but training is not the same as a match, so I will play 45 minutes tomorrow for the reserves. “In three weeks, we have a Champions League game that, if all goes well tomorrow, I could play in that,” the Argentine added. The hectic Christmas schedule will be that opportunity for us to pile up the points as we aim to narrow the gap to Manchester City, as Rojo is expected to be joined in first team by the likes of Ibrahimovic, Carrick and Pogba who are all carrying or suffering one form of injury or the other. Rojo was not highly rated by manager, Jose Mourinho when the Portuguese arrived at Old Trafford last summer, but grew to become one of the first names on the sheet by forming an impressive partnership with Phil Jones. United know the need to ease him slowly into full first team action so as not risk aggravation, and Rojo himself has admitted he knew he has to take things slow.